I have set a goal for Winter Break. While I recognize the need for rest and relaxation, I don't want to sit around like a lump on the couch the whole time. I want to get out and do something active most of the days we're off. Today, we were off to a great start! My alarm went off at 7am (a full hour and a half later than normal), but we stayed in bed for about another 30 minutes. 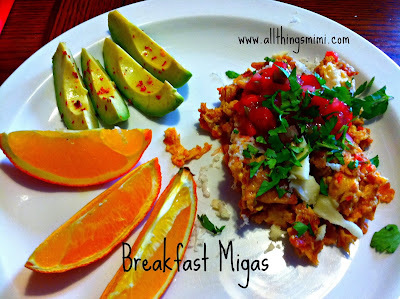 For breakfast, I decided to make migas. I had never heard of this dish before I moved to Alamosa, CO. I'm assuming it has it's beginnings in New Mexico. I find it's a great way to use up the crumblies left in the bottom of the bag of tortilla chips. I start by heating some oil (olive or canola) and putting the dredges of the chip bag in the pan. I let them sizzle around and toast until they are light brown. Then I throw in some chopped onion and fresh jalapeno. After the onion softens, I put in diced tomato (this time of year I use canned- in the summer, I use fresh). After the tomatoes have warmed through, I throw in 3 beaten eggs that have been seasoned with salt, a little milk and about a tablespoon of sriracha chile sauce. After the eggs are scrambled, I plate it with garnishes of pico de gallo, fresh cilantro and lime juice. This morning I also added to the plate some sliced oranges, and sliced avocado (seasoned with salt, lime and crushed chile de arbol). After breakfast I sat down and almost finished a fingerless mitt I'm working on for a friend. I also watched 2 episodes of "Top Gear" on BBC America. 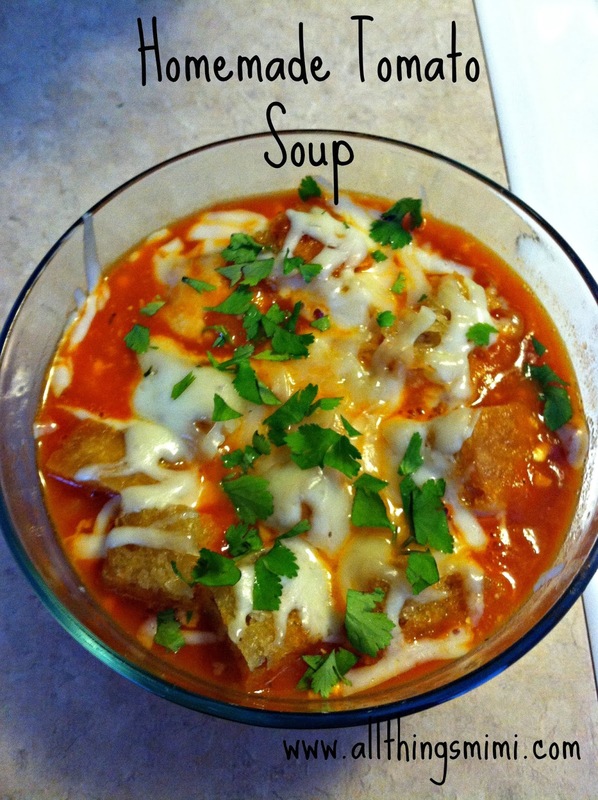 For lunch I wanted some soup, so I made tomato. There are a zillion recipes for tomato soup floating around on the interwebs. I decided to wing it and clean some stuff out of the pantry and fridge. I started with half a chopped onion. I sauteed it in olive oil until it began to soften. Then I added a can of fire roasted diced tomatoes and about a cup of chicken stock. I let that come to a simmer and added some Greek seasoning blend I had in the spice rack. After about 10 minutes of bubbling, I put it in a bowl and added a handful of cubed home made bread that I sauteed in olive oil to crisp up. On top of the bread cubes I put a handful of shredded mozzarella cheese. I popped the bowl in the microwave for about 30 seconds to melt the cheese. I garnished with the last of the chopped fresh cilantro. In addition, for my bowl, I added some diced avocado and just a bit of Greek yogurt. After lunch, we took a nap. About 3ish we bundled up and went cross country skiing. While I like being outside, skiing really isn't my thing. I spent the vast majority of the time face down in the snow. And I do not have the strength to pull myself up without taking the skis off. That makes for a long afternoon. I think dinner is going to be a pickled beet and goat cheese salad. I hate to undo all the good I did out on the golf course!